Derry is the Student Ministries Pastor at Nappanee Missionary Church and a DYM author. We released 9 of his resources on the site that are specifically geared toward partnering with parents. 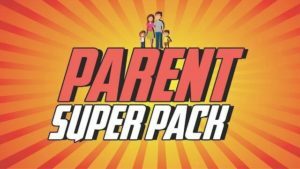 You can buy all 9 (valued at $50) for a ridiculously cheap $25 in our Parents Superpack. In our ministry we have historically talked a lot about the importance of partnering with parents. You probably do too, but what do we mean when we say it? Bob Lahblaw is a married lawyer who works in at a major firm and gets together with a college friend 3 times at the gym to work out. In that short sentence I’ve hit 3 different “partnerships” that are vastly different. 1. As a married man, Bob’s spouse is a partner. 2. In the law firm, he has business partners. 3. In the gym, he has a workout partner. Can you imagine if Bob started approaching his workout partner in the same way he approached his business partner? Or what if he took the same attitude toward his spouse that he did his workout partner? It wouldn’t be long before Bob would be bankrupt and divorced, right? Here’s the point. We can say we want to partner with parents, but what does that look like? 1. Our partnership will be rooted in the GOD THINGS over the GOOD THINGS. In the same way Paul talks to the church in Philippi about their “partnership in the gospel,” the parents of your ministry need a partner who is laser-focused on the spiritual development of their kids. Be that partner! There are a lot of people partnering with parents to develop students academically, athletically, etc. Although some of these teachers and coaches may be Christians, there are limitations on what they can do as well as other motives to the investment. We care about one thing… students encountering an authentic relationship with God. Keep that in mind and make it known! 3. The Partnership Model: We are Aaron and Hur to their Moses. Exodus 17 tells this bazaar story of the Israelites fighting the Amalekites. In the battle, the Israelites were winning as long as Moses’ arms stayed in the air with his staff in hand. In order to keep his arms in the air when he got weary, Aaron and Hur came on each side of him and held his arms up. You and I are to be the Aaron and Hur to the parents of our team. When they are growing weary, we can come alongside them through prayer, affirmation and encouragement. Outside of promotion, this is where use social media, texting and email the most. We also want to equip and empower parents as we partner with them, but the above three are the ones we have sought to focus on and clarify to parents. Is it time for you to have a “Define the Partnership” in your ministry?